Barça Women took all three points at Albacete thanks to a 0-3 win in which they were dominant throughout. Martens and Duggan scored in the first half to set Fran Sánchez’s side on the way to their 15th victory, and consistent possession allowed the visitors to keep up a high pressure game which eventually brought further reward, Guijarro scoring Barça’s third in the 89th minute. 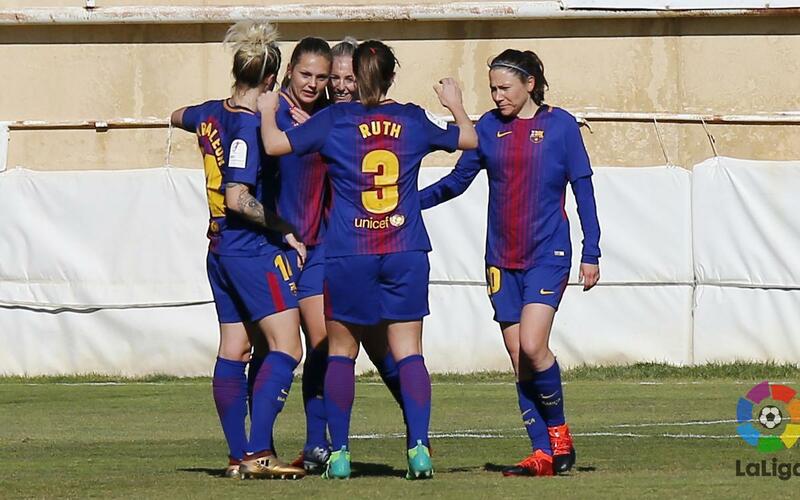 The hosts were caught out by Barça Women’s fast start and it didn’t take long for Lieke Martens to register her seventh league goal of the campaign. Defensively sound, the away side were dominant in every attacking facet of the game. Losada, Guijarro, Martens and debutant Perle Morroni all tested the home keeper before Toni Duggan extended the Blaugrana’s lead just before the break. At the beginning of the second half, Barça didn’t take their foot off of the accelerator, and had four more chances in the opening five minutes. Albacete could barely get out of their own half with visiting keeper, Paños, not having a save to make in the entire match. Guijarro’s late third put the gloss on Barça Women’s seventh consecutive win, and sets them up nicely for their next fixture against Real Sociedad at home.